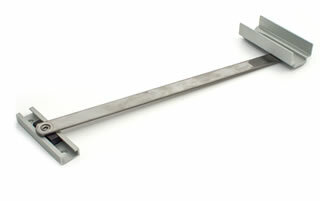 Tilt restrictors from Caldwell allow for the retention of sashes up to 50kg (depending on the selected version) whilst in the tilting position. The retention provided by the tilt restrictor facilitates cleaning which is both easier and safer for the end user, as it can be done from inside. Featuring integrated bi-axial anti-jamb devices, Caldwell’s tilt restrictors ensure that once lowered, the sash is able to seamlessly return to its upright position. Depending on the required sash weight, and levels of usability, Caldwell can supply three tilt restrictor variants: standard, quick release and heavy duty. 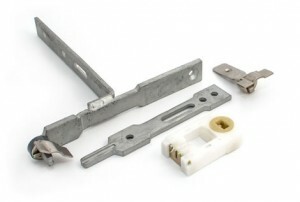 Standard bar tilt restrictors can be specified to support sashes up to 35kg in weight, and are manufactured with stainless steel arms to offer excellent levels of strength, durability and reliability. On all but the smaller sash windows, it is advised that tilt restrictors are fitted to both the upper and lower sashes, and always if the weight of both sashes exceeds 35kg. They must always be fitted in pairs on each side of the sash. Caldwell’s quick release tilt restrictors retain the same design features of the standard tilt restrictors, but also incorporate a sophisticated quick release mechanism to make removing the sash a quick and easy process. This tilt restrictor design is particularly useful for sashes located in recessed apertures, or where access to the sash is restricted. Designed for use with heavier sashes, heavy duty tilt restrictors from Caldwell are suitable for use in sashes weighing between 35.5kg and 50kg. With maximum levels of safety, sashes weighing up to 50kg can be supported when tilting to facilitate easier cleaning for the end user. To support the extra weight, our heavy duty restrictors are designed with buffers and dual arms to more evenly distribute the weight across the sash, and unlike our standard models, they come in a length to cover all sash heights from 900-1550mm. For more information on any of our tilt restrictors, please refer to our tilt restrictor matrices for the standard, quick release and heavy duty variants.